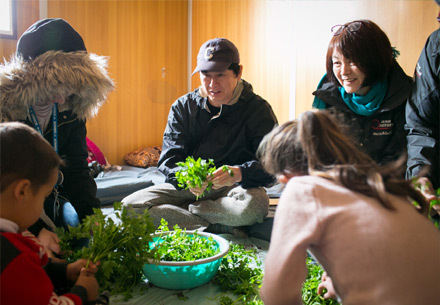 In early March 2019, Japan Platform (hereafter referred to as JPF; Chiyoda-ku, Tokyo) visited refugee camps in Jordan with a contemporary artist Yoshitomo Nara. The number of people worldwide who are in need of aid is increasing due to what some say is the worst humanitarian crisis since World War II as well as frequent natural disasters brought about by climate change. As conventional methods and aid workers can no longer solve these issues alone, it is becoming more and more important for international NGOs to partner and cooperate with a diverse range of people. For this project, JPF asked Nara, who supported JPF in assisting affected people by the Great East Japan Earthquake*1, to interact with and experience the life of refugees living in Jordan, where JPF has been delivering aid through its Response Program for the Iraq-Syria Humanitarian Crisis since 2011. JPF×ART is a project that hopes to raise awareness of the refugee issue among various people in Japan who are often distanced from these issues, and lead them to see it as their own problem and think deeply about it. To achieve this, JPF sought the cooperation of Nara, who continues to inspire fans around the world through his artwork and messages related to social issues. This project also strives to contribute to the creation of artwork by the socially conscious artist. 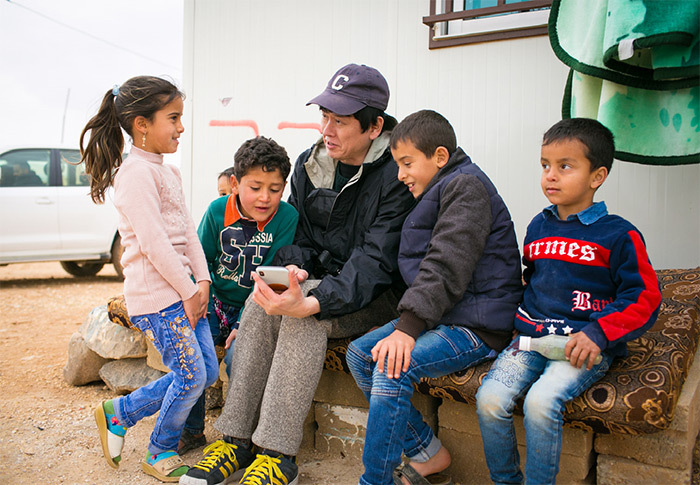 In Jordan, Nara spent time with refugee families and children that live in two refugee camps (Zaatari, Azraq) and a host community in Jordan's capital, Amman. He has continued to share his experience in real-time through his Twitter account*2, not only during his visit but also after returning to Japan, and JPF encourages many people to take a look. A glimpse of his visit is introduced in this press release as well. JPF will be introducing Nara's thoughts and experiences gained during the visit through its official website, social media including Facebook and Twitter, and various events, so please look forward to them. 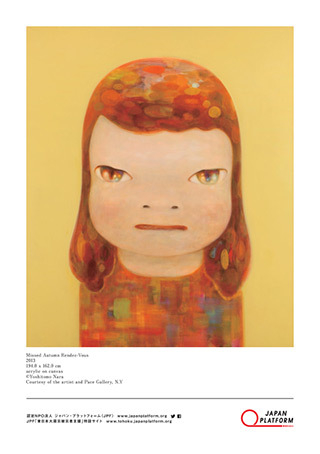 *1: Nara supported JPF in assisting affected people by the Great East Japan Earthquake through donations as well as providing a public message and giving JPF permission to use his artwork. *2: Due to JPF's safety guidelines, no public announcements could be made before or during the visit. For the aim of this project, JPF allowed Nara to tweet about his experiences in real-time under the condition of not specifying the time or location. At the Zaatari refugee camp, Nara received a briefing from the Office of the United Nations High Commissioner for Refugees (UNHCR), which runs the camp, and visited the supermarket run by the World Food Programme (WFP) that provides food to refugees. Then, he shopped for groceries at the supermarket with the Abdullah family, made Syrian home cooking and had lunch together. Nara visited a school inside the Zaatari refugee camp that is supported by Children without Borders (KnK), a JPF member NGO. He showed slides with photos of where he grew up as well as his artwork. 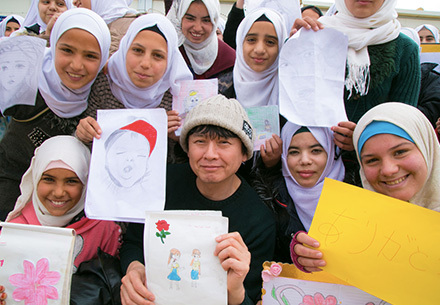 He also talked with the students, sending them the message that everyone is unique, and that Japan, Jordan and Syria are similar in that what you find is different depending on where you are within the country. After that, each student gave Nara a drawing that they drew as a gift. 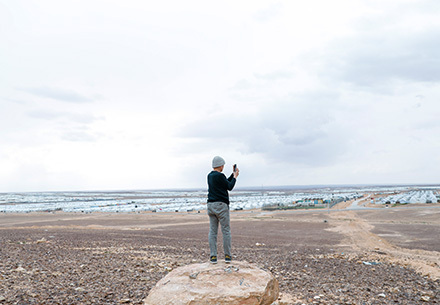 Nara travelled to a hill that provides a panoramic view of the Azraq refugee camp, where over 40 thousand Syrian refugees live in a massive area that spans across approximately 15 square kilometers. Roughly 20% of the refugees at that camp are 5 years old or younger, 60% are younger than 18, and 240 are orphans. 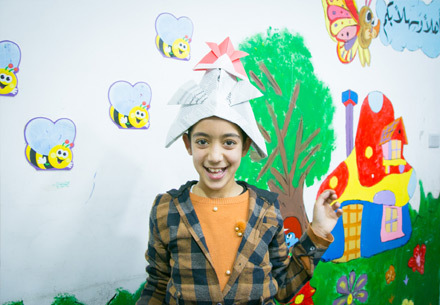 At a host community in Amman, Nara visited a mother & child center where widows and their children live together. He gave advice to mothers who make and sell crafts such as traditional Syrian embroidery to support their livelihood. Together with JPF staff members, he also showed children how to make Japanese traditional hats and slippers by folding newspapers. JPF was founded in 2000 as a new and uniquely Japanese framework for emergency humanitarian assistance. In order to deliver prompt and effective assistance within and outside of Japan, JPF coordinates the efforts of NGOs, the business community, and the government, all of which participate as equal partners, and provides various types of support to member NGOS in Japan. Since 2000, we have built out trust through over 1,400 projects in 47 nations and regions totaling over 54 billion yen in assistance as we promoted cooperation among corporate partners and NGOs and accurately reported our activities. We share information and create humanitarian assistance projects together with our 43 member NGOs with diverse strengths. After the Great East Japan Earthquake and Tsunami, over 7 billion yen had been provided from corporate and individual donors for disaster relief, and we partnered with locally-coordinating intermediary support organizations in providing assistance for local NGOs and contributed to the systemic development towards reconstruction.